One day before frying, toss the chicken with the kosher salt, bay leaves, thyme, rosemary and garlic. Place uncovered in the fridge on the bottom shelf overnight. Rinse and dry the chicken and bring to room temperature, 30-60 minutes. Place a baking sheet set with a wire rack insert near the stovetop. Combine the flour and cornmeal with the spices in a shallow dish; place the buttermilk in a bowl. Heat about 1 inch of frying oil in large, cast iron skillet over medium to medium-high heat to about 360ºF. Working with four pieces at a time, coat the chicken in flour, then buttermilk, then flour again and fry to golden on each side; transfer to the baking sheet. Once all of the chicken is brown and crispy, place in the lower third of oven and roast for 30 minutes to cook through. Serve with hot sauce and honey for topping and pass sides of your choice, such as mashed potatoes or biscuits, oil-and-vinegar slaw salad or cooked greens. In Recipes-list.com we have selected the most viewed recipes from category - uncategorized . Enjoy the best recipes specially selected for you! 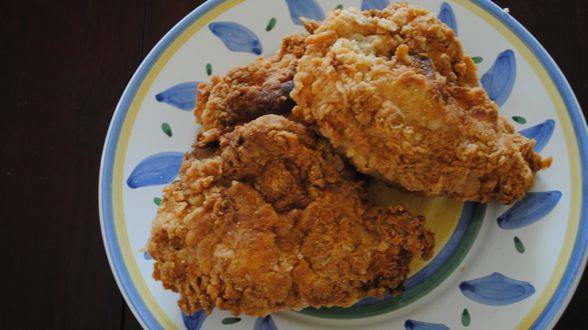 10-Flavor Double-Dipped Buttermilk Fried Chicken is the right choice that will satisfy all your claims.